Hello everyone. It’s been a pretty busy couple of weeks. Thanksgiving is but a memory, and Christmas is heading our way. I’ve been truckin’, so to speak in my studio. I’m also finishing my last customer quilt job for this year. It is a beautiful quilt, for one of my great quilt piecer friends. She definitely keeps her sewing pedal to the metal! I instagrammed a photo yesterday. I hope you follow me there, so you can see the first couple borders quilting design. I think it really ties into the fabric motif so nicely. Well… today was going to be a full day of quilting on that quilt, but I had to change my plans to go to Denver for some supplies for our barbershop. The new barber is set to move in on Monday, so we couldn’t wait for shipping, I HAD to go to the city! I did manage to hit three quilt shops while I was there… and I found a great eagle quilt pattern, a couple yards of fabric, and an extra cone of quilting thread, just in case I run out mid-quilt on this current job. It really was a beautiful day to be out! I just love these nice December days in Colorado! 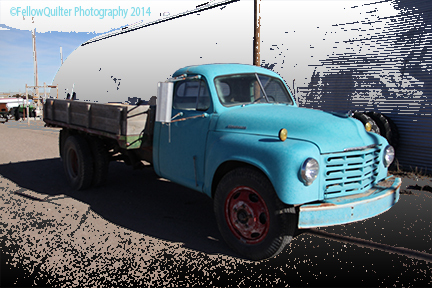 I took my camera along for the ride, and in Akron, I spotted this old truck. I had to turn around and go back… The door was open to the building behind, and I did poke my head in to ask permission, but nobody was around. I hope they like how I photoshopped the image. I just love playing with my photos! This truck was empty today, and pretty soon, my quilting workload for Christmas will be unloaded as well. I hope your projects are also coming along right on time! Hello everyone. I’ve had a busy beginning to this Thanksgiving week. I am a few days behind on the Photo 101 challenges. I’m going to catch up now. For Tuesday’s assignment, we were to photograph glass. Our house is filled with glass. To be specific, we both collect glassware, and our home has 47 windows. I just finished sewing 80 more strip sets for my scrappy quilts, and turned off the main studio lights, thinking I’d head to bed. However, I noticed the awesome fringe on this lamp, just outside my studio in the hallway. It’s late in the evening, so not much light in the upstairs hallway, except for one of the bulbs in this lamp. I love the effect that a lone light can play on the mood in the area. 1-the mood the light gives. 2-playing with the juxtaposition of in-focus strands against the out-of-focus ones in the background. 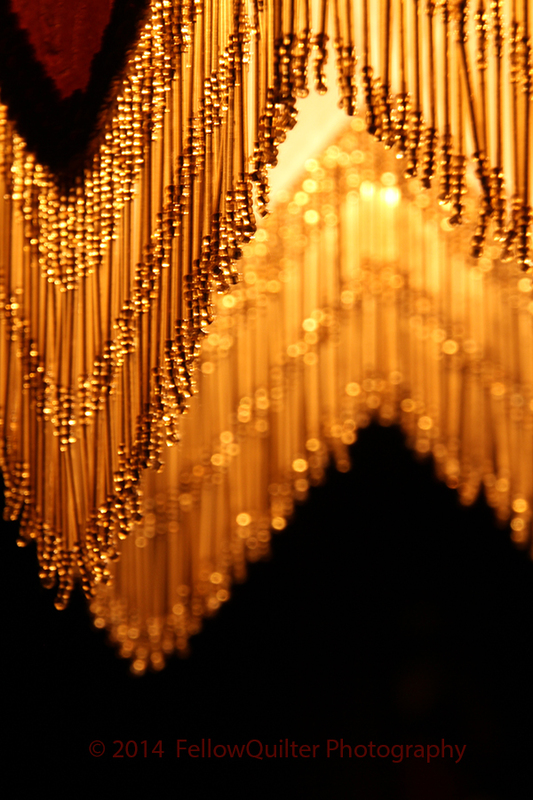 3-the way the layers just lure you into the center of the lamp. I hope you enjoy this photo too. Have a great night on this Thanksgiving Eve! Hello everyone. 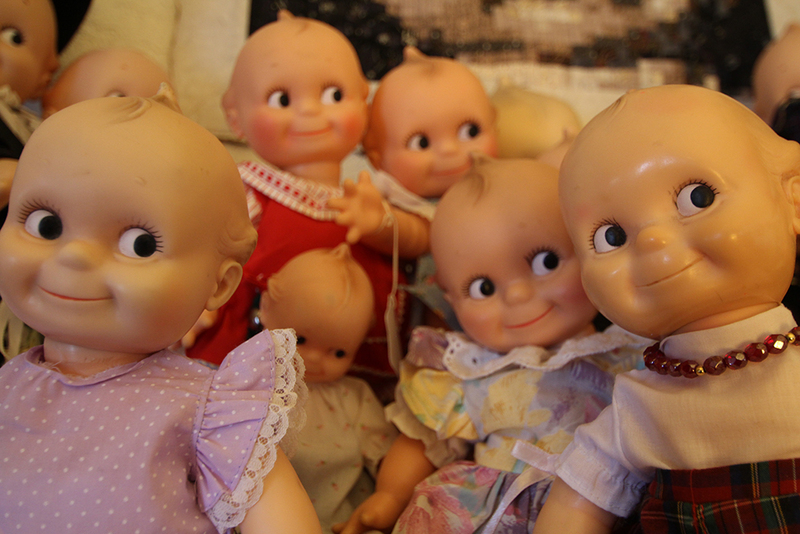 Today, for my Photo101 posting, I’d like to share this “Swarm” of Kewpie Dolls. My Sister-In-Laws doll collection is very large. You can’t help but wonder what they might be thinking, Right? Enjoy this small sampling of some of her favorites. Her first doll was made by the Cameo company, and she received Kewpie (We call her “Number 1”) for her birthday as a small girl. “Number 1” is on the right with the necklace. If you want to read more about Cameo Dolls click here.